7 Responses to "Aadhi roti saara kabaab"
It is NOT YOUR fault that I DO NOT like Non-Veg Songs being a strict Vegetarian. In addition, R Khanna was not my favorite actor, either. He was my favorite till Amitabh walked in. 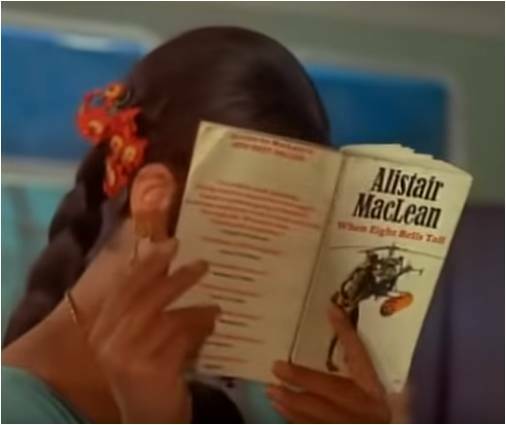 The Alistair MacLean novel that Sharmila is pretending to read, is ‘When Eight Bells Toll’. thank you sudhirji. i have been trying to read the title of the book for the last 100 years, that is ever since i associated with ASAD. You can click on it to see enlarged version.